The stage was now set for the final battle of the Civil War of 193-197. After his general Lupus’ defeat against Albinus, Severus took personal command of his army. His forces engaged those of Albinus near Lugdunum (present-day Lyon in France) on 19 February. Cassius Dio claims that there were 150.000 soldiers on either side, and although this is probably an exaggeration, both armies must have been large. In any case, the armies were evenly matched, just like at the Battle of Issus. Dio and Herodianus left somewhat different accounts of the battle, but both historians agree it was a bloody affair. Dio tells us that Severus easily defeated Albinus’ left flank, but was lured into a trap by his right flank, which feigned a retreat. Severus’ troops pursued them and his front ranks fell into well-hidden trenches dug by Albinus’ forces. In the confusion, Severus’ men were hard-pressed and the general had to come to the rescue with his praetorians. Dio says Severus lost his horse, then got rid of his cloak and tried to rally his running soldiers while on foot. Some of them turned and faced their pursuers. When Severus’ men gained the upper hand again, general Laetus rode in with his cavalry and won the day for his emperor. Herodianus has a different version. In his story, the outcome of the battle was uncertain for a long time. Then Albinus’ troops began to push back those of Severus and the latter fell from his horse and fled, throwing off his imperial cloak. Suddenly, Laetus appeared on the battlefield with fresh troops. His appearance gave Severus’ forces heart again. The emperor mounted a new horse and was given back his cloak. Laetus’ troops engaged those of Albinus, threw them into disorder and won the day for Severus. Both Dio and Herodian agree that the ambitious Laetus aspired to become emperor himself. He would later be executed by Severus. Whatever happened at Lugdunum, the battle was a hard-fought, bloody, but decisive victory for Severus, who thus ended the Civil War and became sole ruler of the Roman Empire. The city of Lugdunum was pillaged by Severus’ victorious army, which set fire to the town. Albinus was either captured and executed, or died by his own hand. His head was cut off and brought to Rome. 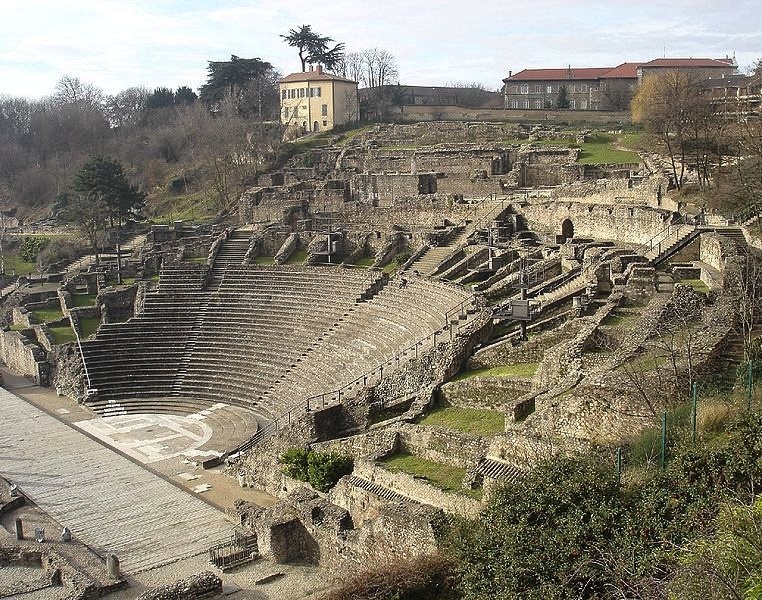 Theatre of Lugdunum (photo: Vincent Bloch). After the battle, Severus announced that he would deify the late emperor Commodus, possibly to spite the Senate, since many senators fought against him on either Niger’s or Albinus’ side. He also called himself a son of Marcus Aurelius and brother to Commodus, horrifying each and every senator. To connect himself closer to the more prestigious gens Aurelia and thus the former imperial family, Severus had already changed his eldest son’s name from Lucius Septimius Bassianus to Marcus Aurelius Antoninus. When the emperor declared himself a son of the great Marcus Aurelius, a senator called Aulus Pollenius Auspex is said to have remarked: “I congratulate you, Caesar, upon finding a father”, with Dio adding that this implied “that up to that time he had been fatherless by reason of his obscure birth”. According to Herodianus, Severus split Britannia into two separate provinces after his victory at Lugdunum. These were named Britannia Superior and Britannia Inferior, and the division was presumably for the same reasons that were behind the division of the province of Syria in 194 (or a little later): making sure that no governor commanded more than two legions. It is more likely, however, that the actual division of Britannia was not implemented until at least 208, when Severus himself travelled to the island and launched his invasion of Caledonia. In any case, after restoring order in the Gallic provinces, the emperor returned to Rome, where he took bloody revenge on Albinus’ and Niger’s remaining supporters. Some 29 senators were condemned to death. Among them was Sulpicianus, Pertinax’ father-in-law, who a few years back had aspired to become emperor himself. The senators’ possessions were confiscated and the emperor created a special fund – the res privata principis – to administer and sell all the goods. Severus then tried to win the hearts and minds of the people by granting them donations and organising splendid games with all kinds of wild animals. He also formally allowed his soldiers to marry, thus legalising a practice which had been in existence for ages. It was clear, however, that the new emperor’s prestige was based more on fear than on true sympathy and respect. The Parthian King Vologases V (Classical Numismatic Group, Inc., CC BY-SA 3.0 license). While Severus was fighting Albinus in Gaul, the Parthians under their King Vologases (Walagash) V invaded Mesopotamia and attacked the important city of Nisibis, the city that Severus himself had retaken from Osrhoene and Adiabene in 195. In the summer, the emperor was ready to fight back. He had raised three new legions, I, II and III Parthica, taking I and III with him on his campaign and stationing II Parthica in Alba, near Rome. Together with the reformed praetorian guard, the emperor now had up to 17.000 fighting men under his direct command. When Severus crossed the Euphrates and entered Mesopotamia, the Parthians had already abandoned the siege of Nisibis and had retreated towards their capital of Ctesiphon. In September, the emperor began pursuing his opponents. During the pursuit, part of his army travelled by land and another part by river. The famous cities of Seleucia and Babylon were easily captured, as both had been abandoned. The Parthian capital was subsequently put under siege. – Historia Augusta, Clodius Albinus 9, 12. – Adrian Goldsworthy, The Fall of the West, p. 64-69.